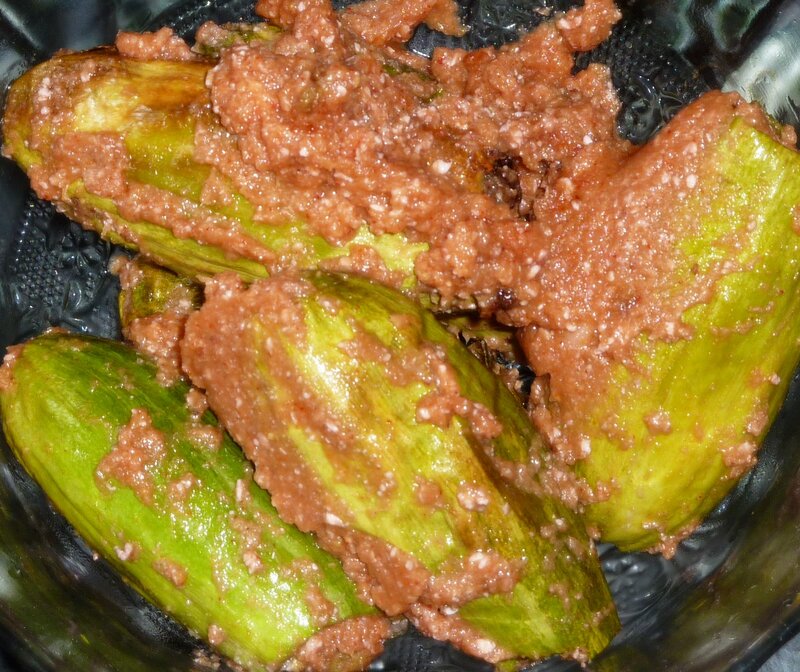 Chingri Potoler Dorma is a famous Bengali cuisine where the potol/pointed gourd/parwal/parval is stuffed with Chingri/Prawns along with poppy seeds and mustard seeds and then deep fried and mixed in a spicy gravy. It can be served with rice or can be had just like it is. Cut the top of each potol (Pointed Gourd) and with a sharp knife or spoon scoop out its pulp. Once you get the potols clear of their pulps then wash and keep them aside. A quick note about using sharp knives in the kitchen, as Jack Moore tells us, dull knives can cause you to slip and cause serious injury, as counter intuitive as it sounds, shaper is safer. Meanwhile in a pan boil the prawns with a bit of salt. Grind the poppy seeds, green chillies, salt and mustard seeds to a paste. Heat 2 tbsp mustard oil and add the boiled prawns and sautÃ© for a minute. To this add the prepared paste and mix well. SautÃ© till the mix is cooked. Remove from heat and let it cool. Once the prawn stuffing is cooled stuff this mix in each potol nicely. After the potols are stuffed heat mustard oil in a heavy bottomed pan and deep fry the potols till golden brown. remove from heat and keep aside. Heat 1 tsp mustard oil and add the onion paste and chilli powder and sautÃ© for 2-3 minutes. Now add the curd to it and mix well , to this add the fried potols and again mix well. Serve hot with steamed rice or you may have it as it is.